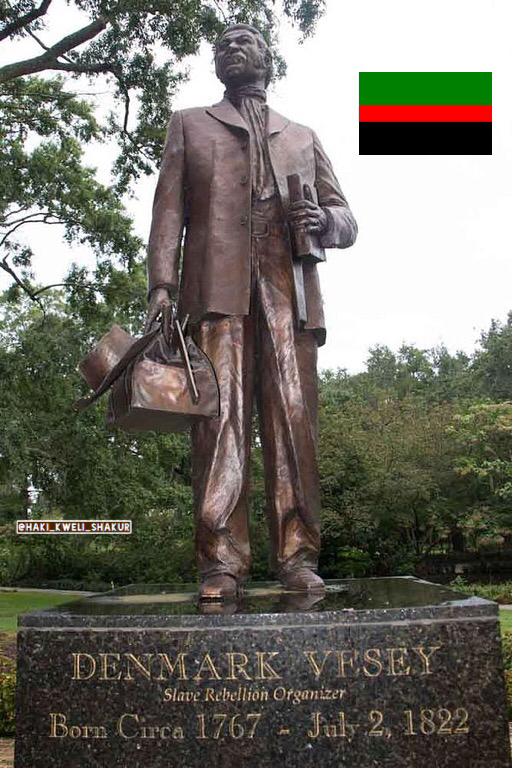 New Afrikan Denmark Vesey planned a slave rebellion with 9000 slaves to get free … Denmark Vesey spent his childhood traveling throughout the Caribbean as an enslaved black servant of a white sea captain, then worked for the captain as a house servant in Charleston, South Carolina. Mr. Vesey eventually started a family, fathered three children and, in 1799, purchased his freedom with $1500 won in a lottery. His family remained enslaved. In 1820, Charleston authorities ordered the closure of Mr. Vesey’s church. Angered by the closure, fed up with the continued enslavement of his children, and inspired by the Haitian Revolution of 1791, Mr. Vesey began planning a rebellion to free enslaved black people in Charleston. The attack was planned for the second week of July 1822. Mr. Vesey modeled his plan after the Haitian Revolution by exhorting his followers to kill their masters, free other enslaved blacks in the city, and sail to Haiti before whites could retaliate. On May 30, 1822, the plan was foiled when a black house servant named George Wilson informed his master of the pending revolt. Charleston authorities promptly arrested and interrogated dozens of suspected conspirators. Mr. Vesey was captured on June 22 and tortured but he refused to identify his comrades. Charles Lynch was born in 1736 at an estate known as Chestnut Hill on the banks of the James River in Virginia, a place at which his elder brother would later establish the town of Lynchburg. The terms “lynching” and “lynch law” are derived from his name. Following the end of the French and Indian War in 1763, the danger associated with life at the frontier greatly lessened and a flood of newcomers began to appear in Bedford County. Lynch’s position as a landowner and leading citizen was by this time well-established. 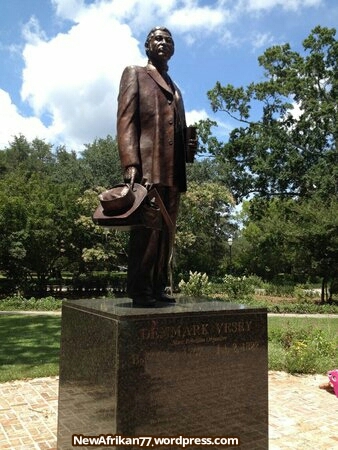 His farming of tobacco and raising of cattle had made him a wealthy man, the possessor of property and African slaves. Lynch served in the Virginia House of Burgesses and the Convention from 1769 until 1778, when he became a militia colonel. After the Revolution, he served in the Virginia Senate from 1784 to 1789. In several incidents in 1780, Lynch and several other militia officers and justices of the peace rounded up suspects who were thought to be a part of a Loyalist uprising in southwestern Virginia. The suspects were given a summary trial at an informal court; sentences handed down included whipping, property seizure, coerced pledges of allegiance, and conscription into the military. 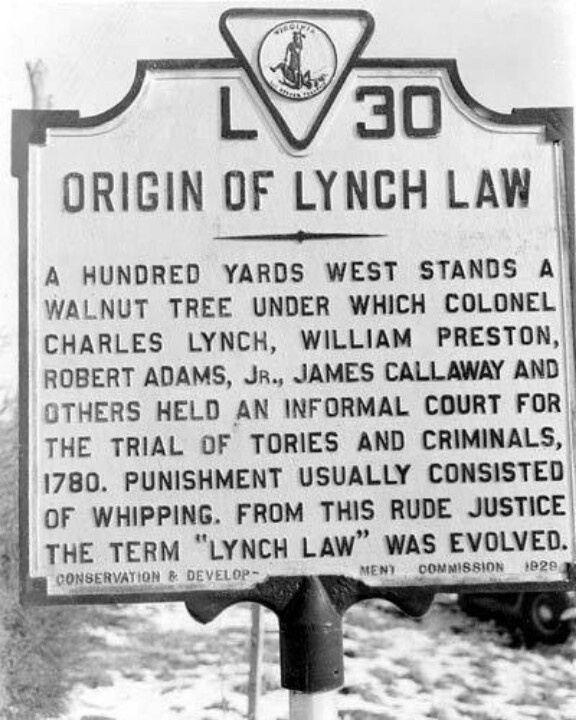 Lynch’s extralegal actions were retroactively legitimized by the Virginia General Assembly in 1782. “Lynch’s Law”, referring to organized but unauthorized punishment of criminals, became a common phrase, as was used by Charles Lynch to describe his actions as early as 1782. The Oxford English Dictionary, however, notes that “The origin of the expression has not been determined.” Variations of the term, such as “lynch law”, “judge lynch” and “lynching”, were standard entries in American and British English dictionaries by the 1850s. In 1811, a man named Captain William Lynch claimed that the phrase, by then famous, actually came from a 1780 compact signed by him and his neighbors in Pittsylvania County, Virginia, to uphold their own brand of law independent of legal authority. The obscurity of the Pittsylvania County compact compared to the well-known actions of Charles Lynch casts doubt on it being the source of the phrase. 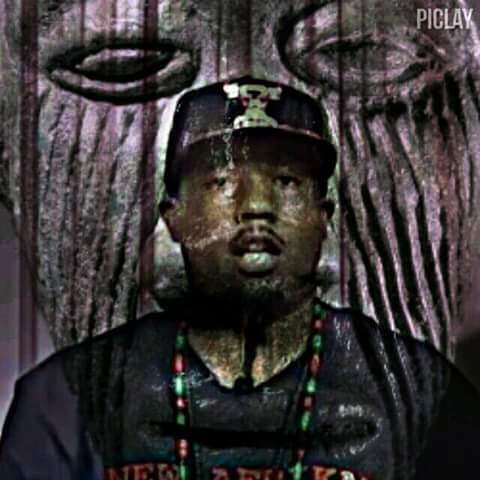 All the black folk and ancestors who were hung by ropes and all the city, county, lynchings public events and execution that took place some of the last words our ancestors heard was Lynch that niqqer , this mans name is origin right here in Virginia and to think his elder brother is how Lynchburg Virginia got its name! 1726. Chapter IV. For the encouragement of constables to perform their duty in conducting runaway slaves, they are exempt from the payment of all public, county and parish levies. 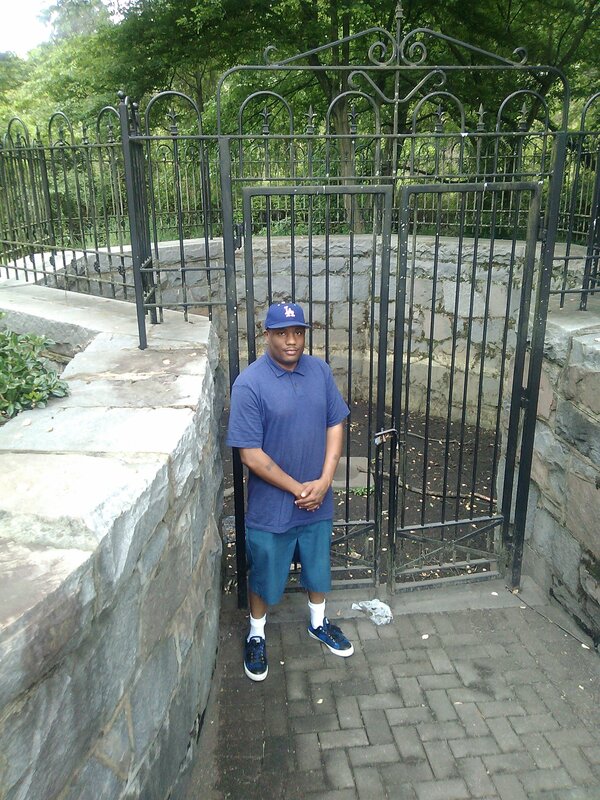 Runaway slaves, whose masters are not known, may be hired out by the keeper of the public gaol, with a strong iron collar with the letters “P. G.” stamped thereupon. 1748. Chapter XXXVIII. The conspiracy of slaves or their insurrection is a felony and the penalty death without benefit of clergy. Whereas many owners of slaves in consideration of wages to be paid by such slaves license them to go at large, to trade as free men, which is a great encouragement to theft and other evil practices by the slaves, in order to enable them to fulfill their agreements with their owners; it is enacted that if any owner license a slave to trade as a free man, he shall forfeit the sum of ten pounds in current money for the use of the poor of the parish, to be recovered by the church wardens. 1778. Chapter I. In the third year of the Commonwealth, Patrick Henry, Esquire, being Governor, at the Capitol at Williamsburg, it is enacted, that hereafter no slave shall be imported into the Commonwealth by sea or land. Every slave imported contrary to the interest and meaning of this act shall become free. 1782. Chapter XXI. It is lawful for any person by last will and testament or other instrument in writing sealed and witnessed to emancipate and set free his slave or slaves. All slaves so set free, not being of sound mind and body, or being above forty-five years of age, or males under twentyone, and females under eighteen shall be supported by the persons liberating them. Provided, also, that a copy of the instrument of emancipation shall be delivered to the slave emancipated. Slaves travelling outside of the county without such an instrument may be confined to jail. 1792. Chapter 41. Whereas slaves run away and hide out and kill hogs, it is enacted that upon intelligence of two or more lying out, they may be committed to jail for trial. If any person aid or abet any person in such a claim for freedom and the claim is not established, he shall forfeit one hundred dollars to the owner of the slave. A person forging or counterfeiting a paper giving a slave freedom shall pay two hundred dollars and suffer one year’s imprisonment without bail. 1804. Chapter 89. When slaves are held by widows or others for life they shall be registered, with the ages, sexes, and increase of such slaves. 1804. Chapter 97. It is lawful for any citizen of the Commonwealth or of the County of Alexandria in the District of Columbia, who has carried or may carry slaves into the county in the district aforesaid, owning lands within this state, to remove the slaves back to Virginia, without penalty, and the slaves shall not be entitled to freedom on that account. 1805. Chapter 11. Carrying away any slave is a misdemeanor, punishable by a fine of from $100.00 to $500.00 and imprisonment in the jail or penitentiary from two to four years, and payment to the owner of the slave of double the value of the slave. Masters of vessels who permit slaves to come on board, or who buy any commodity from a slave without consent of the owner, shall forfeit $200.00 in addition to the penalties now imposed. 1817. Chapter XXXVI. Because of serious inconvenience experienced by Virginians from the frequent elopement of slaves to states north of the Potomac it is enacted that hereafter $20.00 reward, and mileage, be allowed any person who may apprehend any runaway slave attempting to cross the Potomac if the plantation on which the slave is employed be not less than ten miles from the river. If the slave is apprehended in Maryland or Kentucky, the reward shall be $25.00; in Delaware., New Jersey, Pennsylvania, New York, or Ohio, $50.00, plus twenty-five cents a mile. 1822. Chapter 22. Runaway slaves confined in jail hereafter are not to be sold by the sheriff, except on court order. 1823. Chapter 35. The reward for apprehending runaway slaves in Ohio, Pennsylvania, or Indiana, shall be $50.00 and 20 cents per mile for traveling to the residence of the owner or the jail at which the runaway is delivered. The reward shall be $120.00 for apprehending slaves in New York, New England, and the British Provinces. The rewards allowed shall operate as a lien on the slave. If the slave is taken up not more than twenty miles distant from his plantation, the reward shall be $25.00 and mileage. 1823. Chapter 102. A slave of William Tompkins was committed as a free man of color to the penitentiary for fifteen years. It is now enacted that he be sold and the sum paid his owner and he be transported. 1824. Chapter 36. The jailer of Prince William County is allowed certain sums for keping runaway slaves and it is further enacted that hereafter jailers are to report to courts confined runaway slaves within two months. Three disinterested persons shall then value the slave, and if the court be of the opinion that the runaway will not sell at auction for sufficient to pay the prison fees after being confined twelve months, they shall fix the time of imprisonment for a shorter period and order the slave sold. Jailors shall try to ascertain the owners of runaway slaves and notify them by mail. 1835. Chapter 62. If the owner of a runaway slave does not claim him within four months after the keeper of the jail has advertised, the runaway shall be sold. 1836. Chapter 90. If any pilot aprehends and confines in jail any runaway slave found on board a departing vessel, he shall be entitled to a reward of $20.00, to be recovered from the owner. And, moreover, the master, skipper or owner of the vessel in which the slave may be found shall forfeit the sum of $500.00 in addition to the penalties now prescribed by law. 1839. Chapter 76. It is declared a felony to permit slaves to cross ferries or bridges without their owners’ consent in writing, punishment two to five years and liability also to private action. It shall be lawful to commute the punishment of transportation and sale to imprisonment of five to ten years as if the person were free. Persons whose sentences have been commuted shall within thirty days after the expiration of their terms depart from the state, or be dealt with as free persons migrating into the Commonwealth contrary to law. 1848. Chapter 308. Polly Littlepage Smith is authorized, in her own name, as if she were a feme sole, to file a bill praying the court to-permit her to remove certain slaves to Alabama, bond to be given to cause the slaves and their increase to be divided among Polly’s children at her death, according to the will bequeathing them. 1848. Chapter 329. Sarah C. Byars is allowed $600.00 for a slave, Jim, condemned by the Smyth County court and reprieved by the executive for sale and transportation. 1849. Chapter 311. The committee having the custody and control of the person and property of Martha Watts, of Campbell County, who is possessed of a large number of slaves but no land on which to maintain them, is authorized on a proper application to the court to sell the said slaves. 1850. Chapter 316. A slave of Mary B. Nelson, condemned to death, was assessed at $425.00 by the court; the governor has commuted the punishment of death to sale and transportation, and it is shown that the court erred in fixing a price for the slave far below his market value. It is therefore enacted that the governor cause to be paid to Mary B. Nelson, the owner of the slave, such sum of money as he may receive upon the sale. Any master of a vessel who knowingly receives on board a runaway slave shall be confined in the penitentiary five to ten years, and forfeit the full value of the slave, be whipped, etc. If the slave is found on board after leaving port, or in the night time the person in charge shall be presumed to have knowingly received him, and if any free white person advise any slave to abscond, or furnish him money, clothes, provisions, or other facility, he shall be confined five to ten years in the penitentiary, and be whipped as the jury sees fit. A slave so persuading or conniving shall be punished with stripes and sold out of the state. Any free white person who gives information leading to the conviction of a free white person engaged in carrying off a slave, or in any manner concerned in helping an escape, shall be entitled to a reward of $500.00, to be paid by the state. We the black people assembled in Detroit, Michigan, for the National Black Economic Development Conference are fully aware that we have been forced to come together because racist white America has exploited our resources, our minds, our bodies, our labor. For centuries we have been forced to live as colonized people inside the United States, victimized by the most vicious, racist system in the world. We have helped to build the most industrial country in the world. We are therefore demanding of the white Christian churches and Jewish synagogues which are part and parcel of the system of capitalism, that they begin to pay reparations to black people in this country. We are demanding $500,000,000 from the Christian white churches and the Jewish synagogues. . . .
We do not intend to abuse our black brothers and sisters in black churches who have uncritically accepted Christianity. We want them to understand how the racist white Christian church with its hypocritical declarations and doctrines of brotherhood has abused our trust and faith. An attack on the religious beliefs of black people is not our major objective, even though we know that we were not Christians when we were brought to this country, but that Christianity was used to help enslave us. 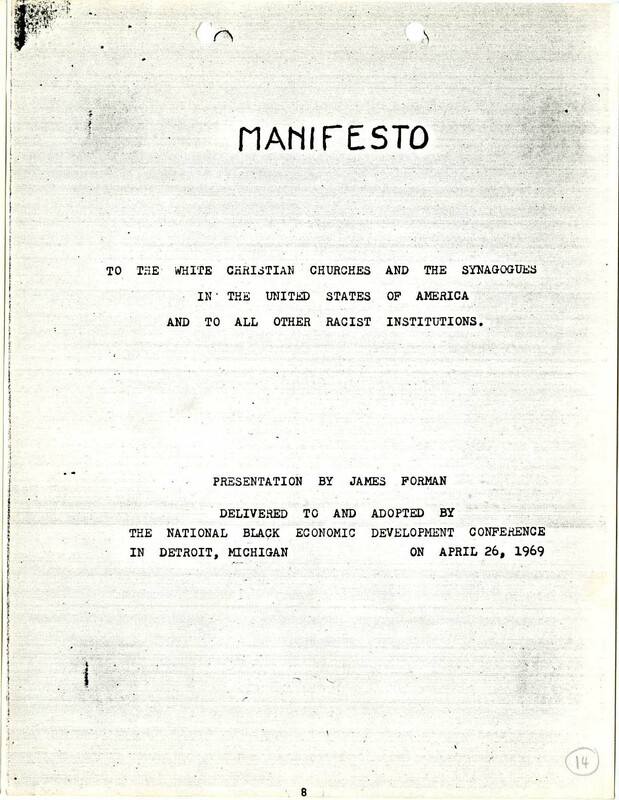 Our objective in issuing this Manifesto is to force the racist white Christian church to begin the payment of reparations which are due to all black people, not only by the church but also by private business and the U.S. government. We see this focus on the Christian church as an effort around which all black people can unite. WE SHALL WIN WITHOUT A DOUBT! It is expected that during the month of June 2016 The Pennsylvania Parole Board will release a decision in regards to whether The Move 9 Sisters will be granted or denied parole. Really this Government has already made the decision in regards to parole for our sisters and they are now stalling to release the decision due to the pressure they have on them in regards to the unjust and continuing imprisonment of MOVE Political Prisoners. We have to keep the Pressure on The Pa Parole Board And Pa Governor Tom Wolf over this issue of our family being illegally denied parole. We are calling on all people interested in freedom and justice to stand in solidarity in demanding parole for The Move 9 Sisters this Thursday May 26th 2016 . 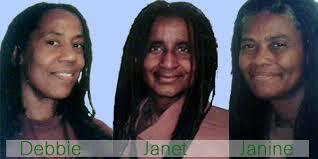 The Demand is clear and has not changed we want the immediate parole of Janet (Holloway) Africa 006308, Janine (Phillips) Africa 006309, and Debbie (Sims) Africa 006307. This is a matter that we are not backing down from and will continue to make an issue of this and to keep the pressure on the Parole Board and Governor. Our sisters were never even charged with weapons charges when convicted in 1980. All three of our sisters were given the recommendation of their institution on various occasions at least 99 Percent of the time when an inmate is recommended for parole by the institution they are in they are paroled by the board but not when it comes to our sisters and brothers of The Move 9. 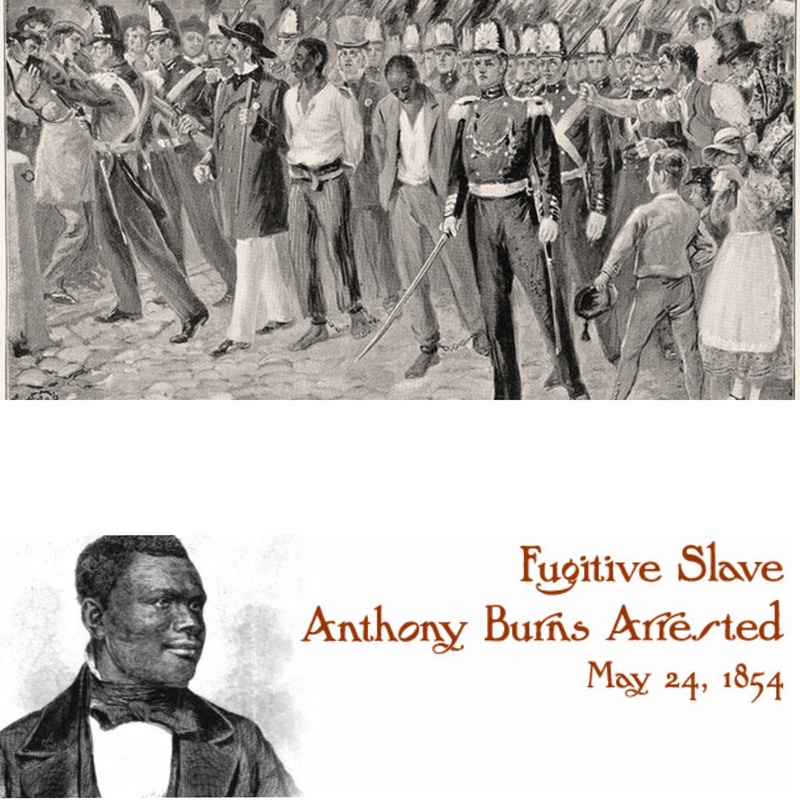 Anthony Burns, celebrated fugitive slave, arrested by United States Deputy marshals in Boston after Escaping Slavery Via Ship in Richmond Virginia. One Thousand-Five Hundred to Two thousand United States troops escorted him through the streets of Boston when he was returned to the South. Anthony Burns (31 May 1834 – 17 July 1862) was born a slave in Stafford County, Virginia. As a young man, he became a Baptist and a “slave preacher” at the Falmouth Union Church in Falmouth, Virginia. In 1853 he escaped from slavery and reached Boston, where he started working. 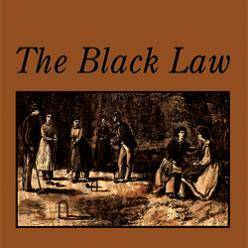 The following year, he was captured under the Fugitive Slave Act of 1850 and tried under the law in Boston. The law was fiercely resisted in Boston, and the case attracted national publicity, large demonstrations, protests and an attack on US Marshals at the courthouse. Federal troops were used to ensure Burns was transported to a ship for return to Virginia after the trial. He was eventually ransomed from slavery, with his freedom purchased by Boston sympathizers. On May 24, 1854 he was discovered “while walking in Court Street” and arrested. As a hub of resistance toward the “slave power” of the South, Boston had numerous residents who tried to free Burns. President Franklin Pierce made an example of the case to show he was willing to strongly enforce the Fugitive Slave Act. The show of force turned many New Englanders against slavery who had passively accepted its existence before. On May 26, before Burns’ court case, a crowd of abolitionists of both races, including Thomas Wentworth Higginson and other Bostonians outraged at Burns’ arrest, stormed the court house to free the man. In the melee, Deputy U.S. Marshal James Batchelder was fatally stabbed, the second U.S. Marshal to be killed in the line of duty. The police kept control of Burns, but the crowds of opponents, including such black abolitionists as Thomas James and Lewis Hayden, grew large. While the federal government sent US troops in support, numerous anti-slavery activists arrived in Boston to join the protest and continue the faceoff. It has been estimated the government’s cost of capturing and conducting Burns through the trial was upwards of $40,000. Burns’s trial was a formality as the requirements of the Fugitive Slave Act were clear and did not require much documentation on the part of slaveholders or their representatives. Richard Henry Dana, Jr. and his associate, the prominent black lawyer Robert Morris, acted as Burns’ defenders, but were not successful in the case. United States Commissioner and Suffolk County, Massachusetts probate court judge Edward G. Loring remanded Burns to his owner, Suttle, of Alexandria, Virginia. Following the decision against Burns, the government effectively held Boston under martial law for the afternoon. The streets between the courthouse and the harbor were lined with federal troops to hold back the waves of protesters as Burns was escorted to the ship for return to his Virginia master. On June 2 throngs in the city witnessed Burns’ being taken to the ship that would carry him back to slavery in Virginia. The matter did not end after Burns was transported south. The events generated strong opposition across the North to Pierce and his administration. Massachusetts residents formed an Anti-Man Hunting League; William Lloyd Garrison burned copies of the Fugitive Slave Act, the Burns court decision, and the Constitution of the United States; and, as a result of the efforts of the Vigilance Committee to lobby the legislature and governor against him, Edward G. Loring, the judge who tried Burns was removed from office in 1857. (The next year Loring was appointed to the United States Court of Claims under President James Buchanan.) In a broader sense, the Burns case fueled anti-slavery sentiments all across the North. Its all about your Chi! May 13, 1971 marks the 45th anniversary of the acquittal of the Panther 21, who in 1971 were the leadership of the eastern region of the Black Panther Party (BPP). 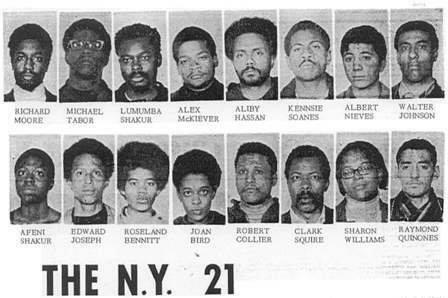 The Panther 21 were arrested in a pre-dawn raid on April 2, 1969 and charged with conspiracy to blow up the New York Botanical Gardens, department stores, etc. On May 13, 1971, after the longest political trial in New York’s history, all 21 New York Panthers are acquitted of all charges in just 45 minutes of jury deliberation. 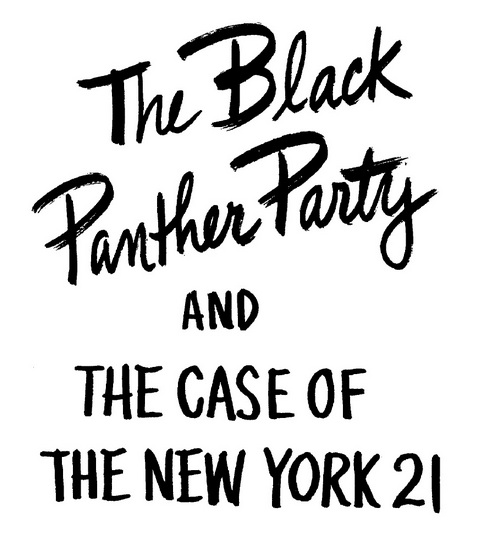 The acquittal of the Panther 21 was a major political setback and embarrassment for the Manhattan District Attorney’s office and the New York Police intelligence unit known as BOSSI which extensively infiltrated and disrupted the BPP’s community programs. 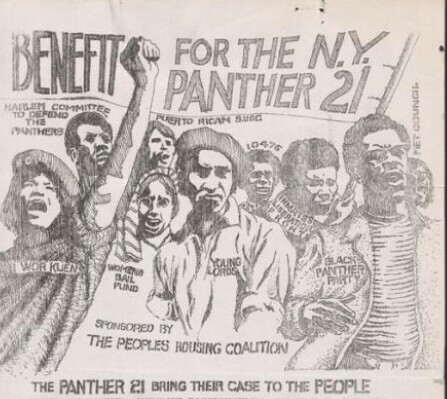 The case of the Panther 21 serves as a classic example of police infiltration and political repression which created a new generation of political prisoners in the United States. For many membership in the Black Panther Party proved to be a serious liability that resulted in assassinations, frame-ups, long-term incarceration. Unlike Mark Rudd, Jerry Rubin and other white “radicals” who were able to re-integrate into the mainstream, the lives of former Black Panther Party leaders were, more often than not, irrevocably shattered. Their lives will bear the scars of the brutal and violent repression they endured forever. Many believe that the indictment of the Panther 21 was a racist and politically motivated frame-up by the government, through its Counter-Intelligence Program, to destroy the Black Panther Party and the Black Liberation movement. The Black Panther Party was a grassroots organization of young Black men and women dedicated to the empowerment of Black people. While the Black Panthers advocated self-defense they never supported unprovoked, random, indiscriminate violence – The right to self defense was but one of the ten points of its political platform. Contrary to the racist image painted by the mainstream media, the BPP was not a bunch of gun-toting thugs, blood-thirsty fanatics. In the late 1960s, as the US. “civil rights” movement grew and became more militant in its opposition to racist and and-poor domestic and foreign policies, the FBI intensified its domestic surveillance and counter-insurgency programs aimed at the Black community. The BPP became the primary target of the FBI’s Counter Intelligence Program (COINTELPRO) The 1974 findings of the Church Committee (a Senate Committee on Government Operations) revealed that almost 90% of the FBI’s counterintelligence activities that were aimed at the Black community targeted the BPP. 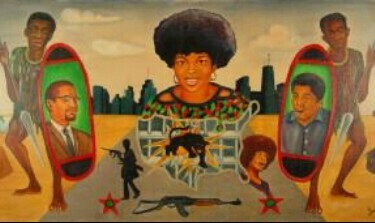 The US government’s Counter-Intelligence Program (COINTELPRO) effectively destroyed radical Black political dissent in the US by murdering, framing, incarcerating its leaders or forcing them into exile. The United States denies the existence of political prisoners within its borders – Instead, the US law enforcement agencies classifies these former political activists that it targeted as mere criminals. Within the US, the criminal justice system (law enforcement, the courts, jails and prisons) is used to repress political activists- Illegal methods were used to frame political prisoners- A review of these cases reveal gross patterns of prosecutorial misconduct which includes: the fabrication or concealment of evidence by the government during trial. Statistics prove that political prisoners consistently receive longer prison terms than do right-wing fanatics or non-political offenders. 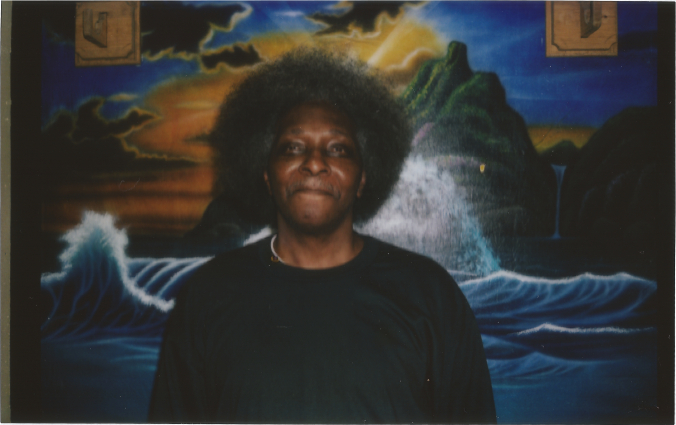 They are also forced to endure the harshest conditions of confinement The majority of political prisoners in the US today are Black and former members of the Black Panther Party. 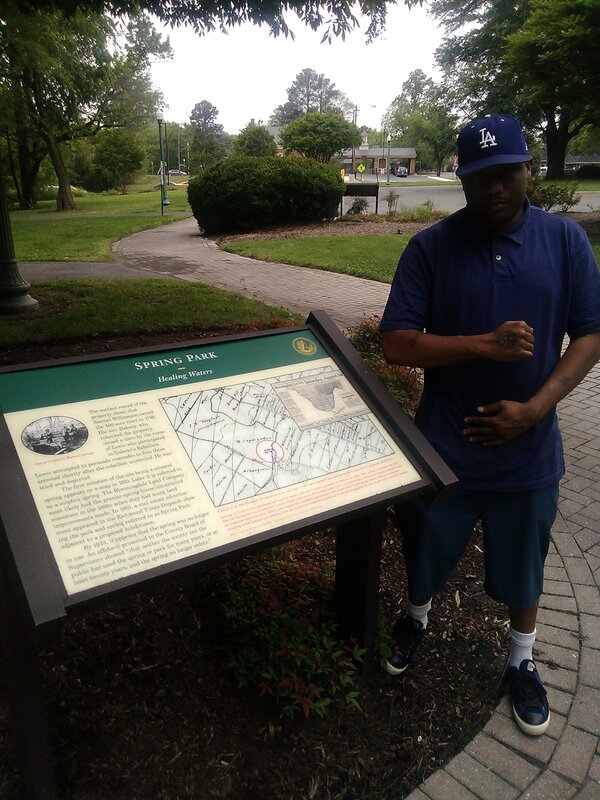 Spring Park is the closest modern feature to Young’s Springs, the site where on August 10, 1800, fellow conspirators elected Gabriel the General of the Rebel Army. Gabriel was enslaved on the Brookfield Plantation in Henrico County. Enslaved men from Richmond, Chesterfield, Hanover, and Caroline attended the meeting, when Gabriel outlined his plan to overtake the capital and convince Governor James Monroe to support more political, social, and economic equality and to create a New Afrikan ( Black ) Nation-State in cirginia. 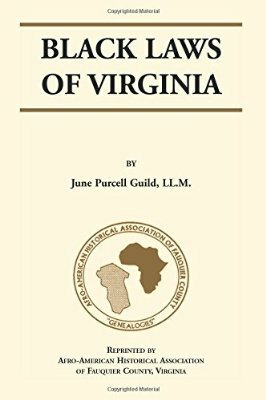 The event became known as Gabriel’s Rebellion, the largest planned slave uprising in Virginia history. Gabriel Prosser at the time of the insurrection was twenty-four years old, six feet two inches, literate, and a blacksmith by trade. He was described by a contemporary as “a fellow of courage and intellect above his rank in life.” With the help of other slaves including Jack Bowler and George Smith, Prosser devised a plan to seize control of Richmond by killing all of the whites (except the Methodists, Quakers and Frenchmen) and then establishing a Kingdom of Virginia with himself as monarch. Prosser and the other revolt leaders were probably influenced by the American Revolution and more recently the French and Haitian Revolutions with their rhetoric of freedom, equality and brotherhood. In the months prior to the revolt Prosser recruited hundreds of supporters and organized them into military units. Although Virginia authorities never determined the extent of the revolt, they estimated that several thousand planned to participate including many who were to be armed with swords and pikes made from farm tools by slave blacksmiths.